So I have started this blog to chronicle and track my journey to completing a Half Marathon run. The reason I wanted to write this is because I feel there are a lot of blogs written by people who live and breathe fitness. Which is great, but I’m not that guy. This is for the guy who just woke up one day and said: “I’m gonna accomplish something that most would think ridiculous”. Lets get a few things straight first. A writer, I am not. This is not some sort of aspiring blog that I hope to parlay into a career one day. It’s a place where the average Joe type can come and realize he/ she is not alone. Now lets give you a background on who I am. I am your typical, standard American male. There is nothing special about me that would give me the edge to completing this. I like beer, fried food and haven’t met a dessert I’d say no to. I.E. I’m not a health nut who’s passion for taking care of themselves made completing a run like this much easier. Sure I have run before. A 5K here and there but by no means am I a “runner”. The reason this all started was honestly to get in better shape. Every summer would come by, and I’d go out for a few runs, do the normal gym routine but never would accomplish anything major. I had always toyed around with the idea of a run like this, but at the end of the day would just back out. Well this time is different. My running started 2 months ago. Nothing major. I think the first week I ran 2.5 miles total. Just to and from. Within about two weeks I told myself I would do a 5K. So I picked one that was a week away and created a running plan that would get me there. Again, nothing major, a mile here, two miles there. I stuck to the plan and in a time of 37:48 I completed the 5K. I wasn’t setting any world records, but I was happy I finished. Now, like so many times before, that’s where it would stop. I’d be happy I did it and go back to my normal ways. Not this time. Immediately after I planned another one for the following month. Again, back to my training plan. A few miles here a few miles there. The runs started to get easier. Nothing more than 3 miles at once but I could notice a change in myself. It was at this time I decided to take the leap. I told myself I was going to complete a half marathon. Ridiculous? Probably. Too much to handle? Maybe. Impossible? Not a chance in hell. I didn’t care what it took, I decided this was my course of action. So I began researching and with only 8 and a half weeks until the day of the run I decided to put in some serious training. So I picked an 8 week beginner plan. Essentially running 3 days a week, cardio work for 2 and resting another 2. Each week you run 1 mile longer from the previous until you reach 11 miles. The longest run I’ve run to date is 5.2 miles. And I feel great! Again, not setting any world records. I am looking for a finishing time between 2.5- 2.75 hours. To reiterate, I am no fitness expert. I couldn’t tell you what one muscle does over the rest in the body. But I can tell you this: it doesn’t take an expert to know all you have to do is put one foot in front of the other. That is my motto: “Take it one day at a time”. Running 13.1 miles is not going to be easy. But you don’t have to look at it as the race day being tomorrow morning. All it takes is waking up every day, looking at your schedule and telling yourself today you will accomplish “X”. And on to the next day. That’s what this is about. I’m nothing special. And I always felt it took someone with a love for fitness to accomplish these goals. Lets get this straight: the thought of running annoys me. Where am I going? Why am I going there? What’s the point? At the end of the day it’s not about how I feel about the run itself. It’s about how I can transform myself simply by just getting up every day. So here I am. Almost 3 weeks into the half marathon program that I thought impossible. The next 5 weeks are going to hurt, be mentally/ physically exhausting and a freaking great time. Come along for the ride with me. 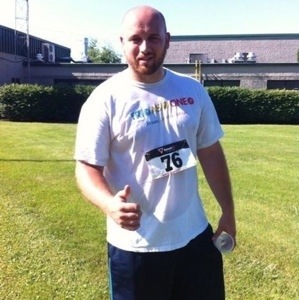 The picture attached is after my first 5K of the summer. Beat to hell, and fighting a cold. My lungs may have as well held as much air as a thimble that day. Not fun! !